Experience the majesty of the red, orange and yellow canyons, mesas and buttes formed by the Colorado River and its tributaries. Canyonlands National Park, located in southeastern Utah, is a primitive desert landscape that is divided into four districts by the Green and Colorado rivers: the rivers themselves, the Island in the Sky, the Maze, and the Needles. The Island in the Sky is the most accessible area of the park. The area offers gorgeous views, paved scenic drives, and a popular four-wheel-drive road. The Island in the Sky is named so because it rests on sheer sandstone cliffs that are more than 1,000 feet above the surrounding terrain. Hiking is a popular activity at the Island. The Grand View Point Trail is one of the most popular destinations and offers panoramic views of the Island. A visitor center and campground is located here at the Island. Visitors looking for a more remote adventure will be happy to visit the Maze, which is the least accessible area of the park. The few established trails here are primitive, and it is suggested hikers bring a topographic map (canyons can be hard to tell apart). Many of the hiking trails are for experienced hikers and require rope and technical maneuvering to traverse the steep rock. Considered the backcountry, permits are required for all overnight stays here. Rafting through the waters of Cataract Canyon can be quite exhilarating. There are 14 miles of rapids, some of which are Class V, which are recommended only for experienced rafters. Anyone interested in boating must first obtain a river permit. Canyonlands park is open year round, and each district of the park has its own visitor center and hours. The districts are Island in the Sky, the Maze and the Needles. Entrance to the park is $5 per person or $10 per vehicle. All campsites are first-come first-serve and range in price from $10 to $15 a night. The park is a “high desert” region and experiences a wide range of temperatures in a single day. Spring (April through May) and fall (mid-September to October) are the most popular seasons to visit, and offer the most pleasant temperatures. Highs can be in the 80s Fahrenheit and lows can drop down into the 30s. While the park may seem quiet and lifeless, that is definitely not the case. The desert is booming with wildlife, just mostly at night. Because of the climate and lack of water, smaller, rather than larger, mammals are more common. Fifty species of mammals are believed to live in the park. Visitors commonly sight many desert cottontails, kangaroo rats and mule deer. Even more commonly sighted are the park’s 273 species of birds. Some of the more common birds include juncos, white-crowned sparrows and ravens. The Canyonlands is considered to be one of the major habitats of the Mexican spotted owl, which was federally listed as a threatened species in 1993. Canyonlands researchers recently spent two years taking inventory of the species. 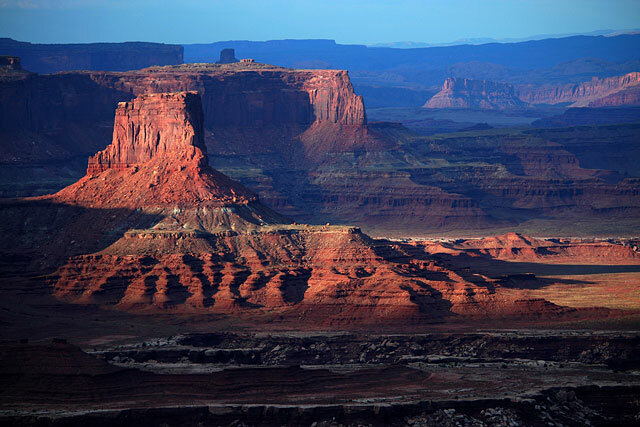 In the Canyonlands’ vast history, few have dared enter into this rugged, harsh, wild region of America. Wind, gravity and water have been the sole architects of this otherworldly terrain. The first humans to pass through the area were Native Americans, about 10,000 years ago. The first Europeans to explore the area were most likely French and American trappers on the hunt for beaver and otter pelts. One trapper, Denis Julius, carved his name along the Green River and on the Cataract Canyon in 1836. Mayor John Wesley organized official exploration of the region in 1869, and for three months explorers mapped out rivers, and recorded information about the area. Mormon church missionary efforts helped to bring settlers to the area, and eventually the towns of Bluff, Moab and Monticello were established. From the 1880s to 1975 the area was mainly used by cowboys and ranchers, herding stock and finding good places for feed and water. In the 1950s, the prospect of uranium brought many to the Canyonlands area. Uranium was in high demand as a result of the U.S. nuclear arms program, so the Atomic Energy Commission built many roads and offered monetary incentive to encourage industry. While there wasn’t much uranium found where the park is today, the roads did allow better access and viewing of the area’s beautiful geological formations. Tourism increased, and in 1964 President Lyndon B. Johnson officially established Canyonlands National Park. November 12, 1971 – The Maze, the Land of Standing Rocks, Davis and Lavender Canyons are added to the park, increasing the its size by 87,000 acres. 1980 – Department of Energy announces plans to create a nuclear waste dump at one of three sites in the Greater Canyonlands. 1986 – Nuclear waste plan eliminated, ending six years of lobbying by the National Park Service and the State of Utah. Click to see a detailed Canyonlands National Park map.